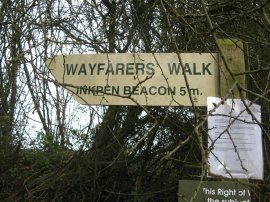 The Wayfarer's Walk is a 70 mile long recreational path which runs between Inkpen Beacon in Berkshire to the village of Emsworth in Hampshire. 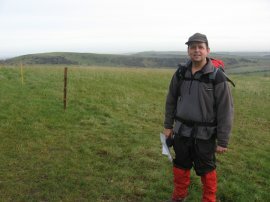 I am doing the walk with Anne from the walking group and we walked this, the first stage, on Tuesday 1st December 2009. Not wanting to spend too much time away from home I had travelled down from London early in the morning and had to endure a very slow journey round the M25 in the rush hour traffic. 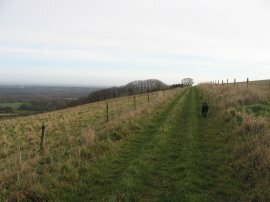 The day started cold with the first frost of the winter which meant that my car struggled to start when I went out and for a while I thought I wasn't going to make it at all however just after quarter past nine I had met up with Anne at Cottington Hill and we took one of the cars over to Inkpen Beacon and the start of the path. 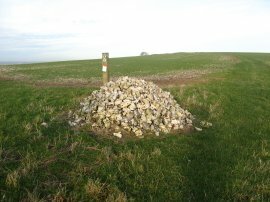 From our parking spot we headed up towards Combe Gibbet, photo 1, on top of Inkpen Hill which marked the start of the path. 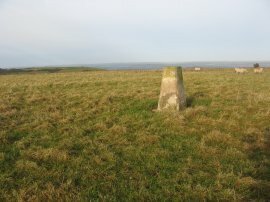 Inkpen Hill is also the start / finish point of the Test Way which runs for 49 miles to Eling Wharf and there is the potential to make a long circular walk, linking the end of Wayfarers Walk with the Test way via the Solent Way. 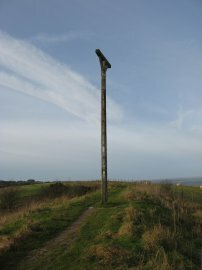 The Gibbet was originally erected in 1676 and is situated on the top of a neolithic long barrow. 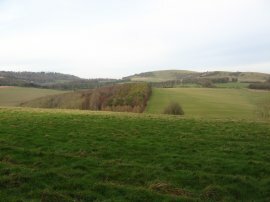 Setting of from the gibbet we headed over Inkpen Hill, photo 2, towards Walbury Hill from where there were good views both to the South, photo 3, and North over the surrounding countryside. 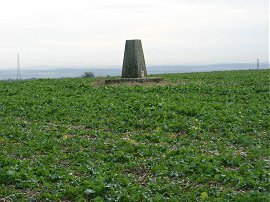 Reaching Walbury Hill we made a brief detour from the path to reach the trig point on top of the hill, which at 297mtrs is the highest spot in South East England and the county top for Berkshire, photo 4. 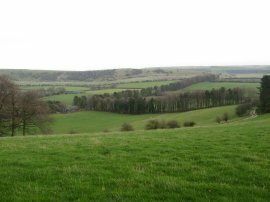 Much of the start of the path is along broad byways running close to the top of a chalk ridge, interspersed with short stretches of road walking along quiet country roads. 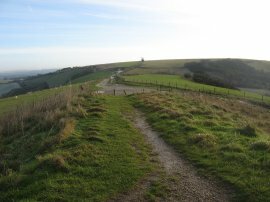 The path runs just below the top of Pilot Hill, photo 5, which is the county top for Hampshire. (8) with 65 to go! 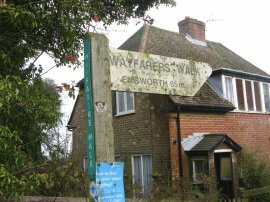 Reaching the crossing point of the A343 a sign, photo 7, indicated that we had now walked 5 miles and still had 65 miles left, photo 8. 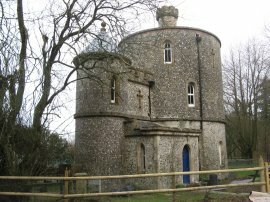 Once over the road we soon reached the grotto in Grotto Copse, well I assume the house in photo 9 is the grotto. 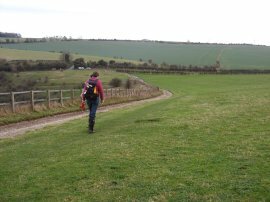 Reaching Upper Woodcott Down, photo 10, we stopped for lunch, before continuing joining a footpath that heads over Lower Woodcott Down before dropping down to cross over the busy A34 dual carriageway at Seven Barrows. 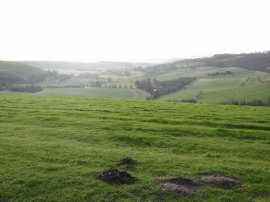 Once again there were good views across the surrounding countryside, photo's 11 and 12. 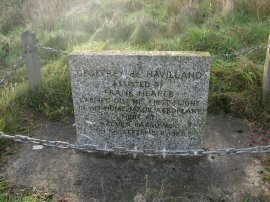 Just before we reached the main road there was a small memorial marking the spot where Geoffrey de Havilland carried out his first flight in September 1910, photo 13. 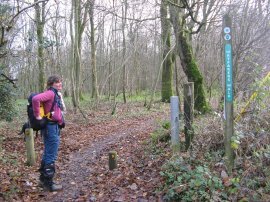 There is a signed diversion from the direct route of the path to a crossing point that runs under the road however we chose to head directly over the road to join a path that headed up a small grassy gully, photo 14. 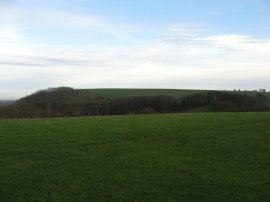 This leads to a footpath that runs alongside a number of larger open fields on top of Great Litchfield Down, photo 15. 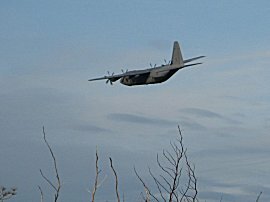 The surrounding area is home to a number of military bases and as we were out walking a number of planes, photo 16, and helicopters were flying quite low around the area. 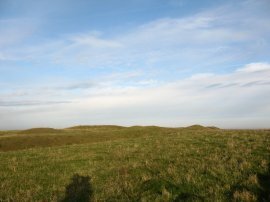 The path heads over the open fields to reach a small cairn, photo 17, which was reminiscent of more northerly walks before continuing on to reach the fenced off summit of Ladle Hill, an incomplete Iron Age Hill Fort, photo 18. 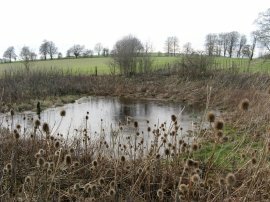 From the fort the route heads round a couple of field boundaries where we passed a pond, photo 19, where the surface of the water had remained frozen all day. Little did I know how many more frozen ponds I would end up seeing over the next three months! 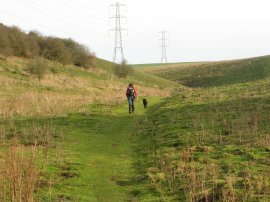 The route then heads down to cross a minor road before taking a track that runs up to Watership Down, photo 20, passing close to the trig point in photo 21. 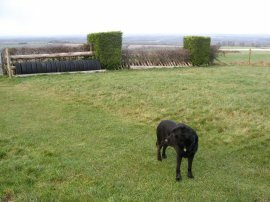 The top of the hill was lined with a number of gallops and associated jumps, photo 22, and we walked alongside for much of the remainder of the walk back to the car park on Cottington Hill where a signpost said we had walked 12.5 miles from Inkpen Beacon, although the total distance we had walked for the day was 13.4 miles. 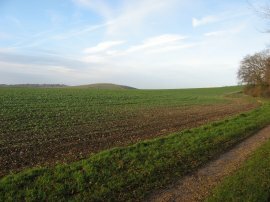 This had been a very enjoyable start to the walk with great scenery along the chalk ridges in an area I had not done any walking before. Couple with pleasant company it made a very nice day out. 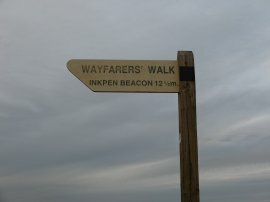 Having picked up my car at Inkpen Beacon I headed over to Basingstoke for the night before heading out to walk the second stage the following day.